Mouse selection tool helps with selecting an element in a visual way and auto-generates identifying properties upon selection. 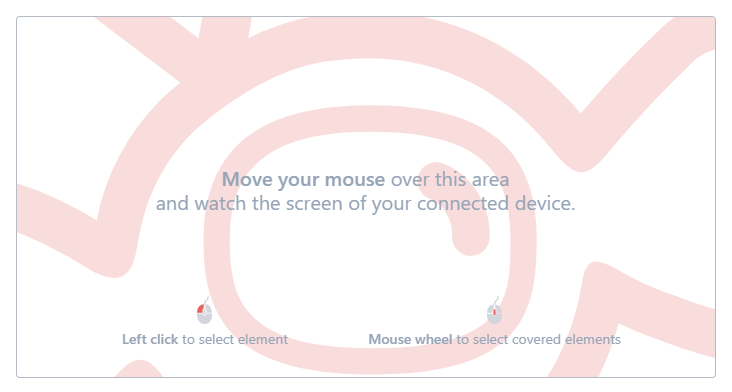 To activate mouse selection tool simply move your mouse over the mouse selection area and look at the screen of your connected device. A simulated mouse pointer will appear on top of the application and it will respond to your mouse movements. To fetch the details of an element move the pointer over it and click. Suitest will also synchronize with the page structure tool and highlight the element in the structure as well. When you select an element using the mouse selection tool, Suitest will generate a set of identifying properties automatically. For HTML based platforms Suitest will use CSS selector, for Non-HTML based applications XPath will be used. Heads up: Depending on the situation, the auto-generated selector may not be optimal. For instance it may depend on parent-child element relationships or on the element order and thus be too fragile to be usable for test automation. In such case you should adjust the selector manually by editing the identifying properties in the corresponding section of the element detail window. The mouse tool has a neat feature to select an element in the background even if it is covered completely by the foreground elements. While hovering over the mouse selection area use the mouse scroll wheel to use this function, each wheel tick will go through one (Z) layer.